According to Weather West, a California weather blog authored by climate scientist, Daniel Swain, the latest seasonal predictions do not inspire a great deal of hope that the coming winter will bring drought relief. “A substantial La Nina event no longer appears to be in the cards. If it’s present at all, it will probably be quite weak.” Seems that persistent West Coast winter ridge may just rear its ugly head again. Even if subtle shifts in the large-scale atmosphere pattern lead to a different outcome here, our persistent drought is still on the table. More and more people are asking me to update their landscaping to use less water and be lower maintenance. Many want a more modern look and what could be more architectural and clean looking than a succulent garden? Converting to a low water landscape requires careful planning and design to achieve the look you want. You need to evaluate drainage patterns, soil types, slopes, areas of sun and shade and building locations. Hardscape features, such as patios, paths and decks require no water to maintain and by selecting permeable materials such as porous pavers and gravel, rainwater can infiltrate the ground. Large boulders can be used as accents. Next comes the fun part- plant selection. In choosing the best succulents for your garden think about if your area gets frost during the winter. Does it have protection from a building or evergreen tree or do you live in a banana belt that rarely freezes? Are you planting in sun, shade or a combination? In addition to the hardy succulents like sedum and sempervivum many showy succulents need only a bit of protection during our winters. Aeonium decorum ‘Sunburst’ is one of the showiest species with spectacular variegated cream and green 10″ rosettes. It looks terrific planted with black Voodoo aeonium. Aeoniums do well in our climate as they come from Arabia, East Africa and the Canary Islands where winter rainfall is the norm. Echeveria grow naturally in higher elevations of central Mexico to northwestern South America and so also do well in our our cool wet winters. ‘After Glow’ is frost tolerant and looks to be painted with florescent paint. There are spectacular hybrids being developed every year. These are not as hardy as the traditional hens and chicks but well worth the effort to find a place where they can survive a freeze. Frilly ‘Mauna Loa’ sports turquoise and burgundy foliage while Blue Curls echeveria looks like an anemone in a tide pool. Aloes from South Africa and Arabia are old world plants. Many, like the medicinal aloe vera, are frost tender, but other such as the tree-like aloe plicitilis are hardy down to 25 degrees and look great either in the garden or in pots. Did you know the Egyptians used aloe in the mummification process or that there are no known wild populations of aloe? In South Africa an aloe called ferox is used in the same way as aloe vera for burns and stomach problems. To ensure success when growing succulents, make sure your soil is fast draining. 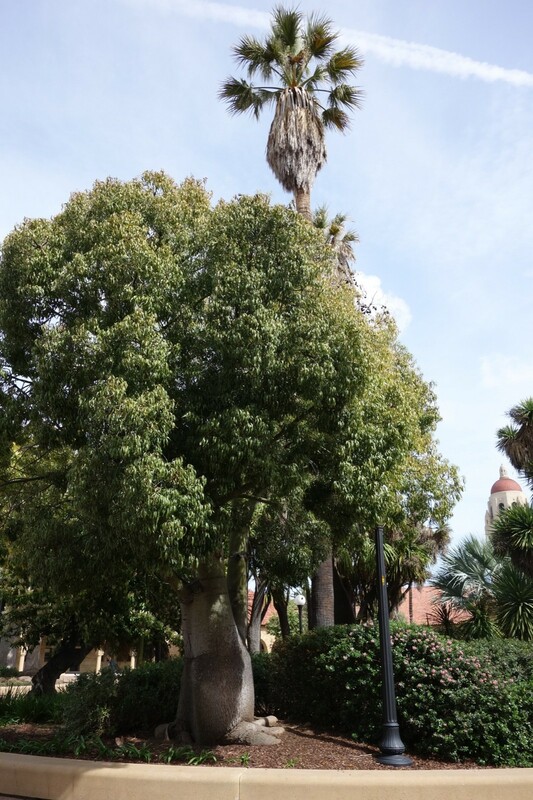 Our winter rains can rot even the toughest plants when their feet sit in soggy soil. Add sand, gravel or pumice to your soil or plant on mounds to increase drainage. There was enough rainfall over the winter season for the California State Water Resources Control Board to modify their Emergency Water Conservation Regulations. On May 18th, 2016 it was adopted to recognize persistent yet less severe drought conditions throughout California and require local agencies to develop and implement conservation standards based on their particular circumstances. My friend, Adelyn, helping to water container plants and edibles. The new standard requires local water agencies to ensure a three-year supply of water assuming three more dry years in the future like the ones we experienced from 2012 to 2015. Water agencies that would face shortages under three additional dry years are required to meet a conservation standard equal to the amount of the shortage. Makes sense to us who have long been on the band wagon to conserve water both indoors and out. Our local water districts have both kept their water conserving restrictions in place. Since up to 70% of summer water use comes from landscape irrigation it’s a good place to start. Both San Lorenzo Valley Water District– http://www.slvwd.com – and Scotts Valley Water Districts – http://www.svwd.org – offer many tips and incentives to conserve water. Using less water-intensive plants, there are lists on their websites of drought-tolerant plants and water smart grasses, as well as replacing lawns with drought tolerant or native plants and/or permeable landscape materials such as mulch, decomposed granite, permeable pavers are just some of the ways you can keep your yard looking beautiful and also be water efficient. 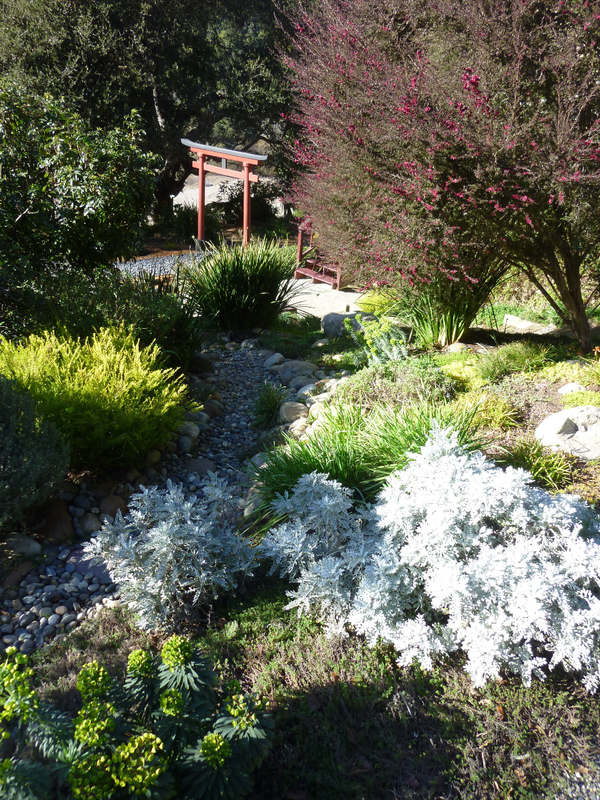 Rebate programs from local water districts offer several landscaping credits including sprinkler to drip irrigation conversion credit, weather-based irrigation controller credit, replacement credit for converting an existing lawn to water-wise grasses, greywater laundry-to-landscape irrigation conversion, rainwater catchment and downspout diversion. Both districts have guidelines and procedures to apply for the rebates on their websites. Additional rebates from the California State Department of Water Resources are available to single-family residences for lawn replacement. This rebate application is separate from the local water District’s and you need to go online and follow the state’s guidelines in order to be eligible for these additional funds. See www.SaveOurWaterRebates.com for the details. The fun part begins when you redesign the area where you took out the lawn or modify the plantings in other beds to include same water use plants. It doesn’t make much sense if you have some plants that require more water than the others in the same bed. You have to water to the highest water use plant to keep everybody happy. Hydrozoning is the practice of clustering together plants with similar water requirements to conserve water. A planting design where plants are grouped by water needs improves efficiency and plant health by avoiding overwatering or underwatering. As you move farther away from the water source your plantings should require less water. Now is the time before it gets hot to look at your irrigation system, plant choices and rebate options to save water and money and recharge our aquifers. With so many people replacing their thirsty lawns with low water-use plants, I’m getting lots of requests for ideas about what to do with all that empty space. The sky’s the limit when you have a blank slate. Let me get you started. If your old lawn was in the front you might consider putting in a sitting area for a couple of chairs and a bistro table. Use simple crushed gravel or more formal flagstone underfoot and surround the space with a low seat wall to add a bit of privacy. Adding a dry river bed is another good solution. A dry river bed can slow runoff, spread it out and sink it back into the soil. Connected to a downspout they keep even more rainfall on your own property. If we get the El Nino storms that are predicted this will be a welcome addition to your landscape. runoff to soak into the ground. Make sure there is a 2% slope from beginning to end to ensure that water is conveyed away from your house to the desired location. Non-woven geotextile fabric is often used underneath the rock. You can create a depression or rain garden at the end of your dry river bed and plant it with plants that tolerate wet feet in the winter. 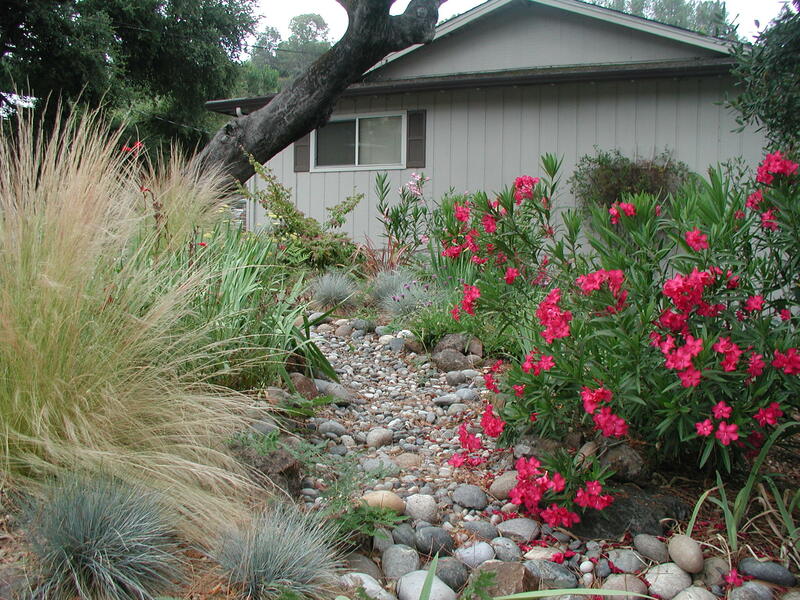 Both a dry river bed and a rain garden allow water to sink back into the ground. 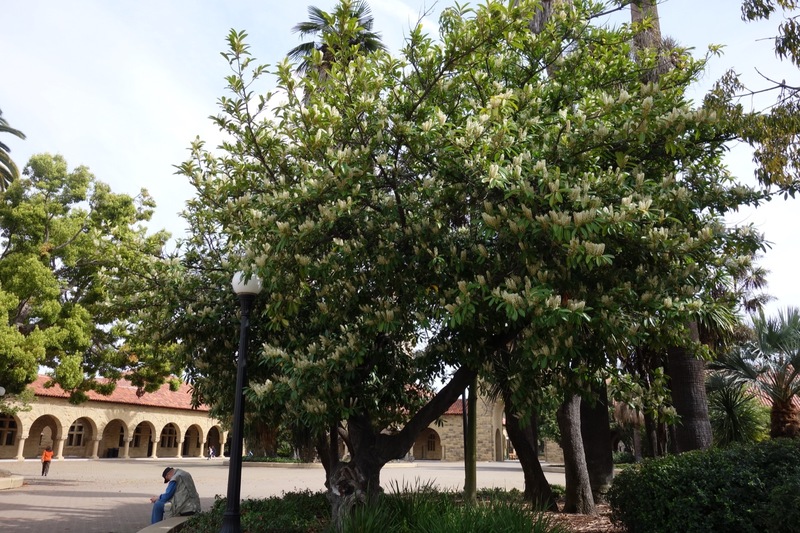 The plants remove pollutants from the runoff from roofs or other impervious surfaces. Sometimes a dry river bed will receive so much runoff that a dry well or dispersal pit is installed at the end. If you have a high water table or clay soil the water may not always soak in fast enough and an overflow device like this is needed. The goal is to keep water on your own property and not in the street or the neighbors’ yard. There are good looking dry river beds as we’ll as bad looking ones. A quick Google image search will show you what I mean. Your goal is to create something that looks like it belongs right where it is. The plants, the accent rocks, the cobble, the location – all need to work together. If your property has a natural slope follow the natural terrain if possible. You can install a dry river bed on flat land also by creating a channel for the river bed to follow. Keep in mind that even a dry river bed is more interesting if it is not all visible at once. Soft, flowing curves and bends create a natural look. Start with the rocks and cobble. Rounded river cobble looks most natural for the creek bed. In nature, water flowing down a river would round off sharp rock edges to produce cobble of different sizes. A river never has just one size of rocks and yours shouldn’t either. Accent rocks can be any type that you like as long as you get a variety of rock sizes and shapes. Use the larger stones to direct and channel water. Placing rocks on the outside of a curve creates a more natural look. As in all gardens there is always a bit of maintenance to keep things looking and working great. Weeding in the first couple of months while plants become established is important. Replenish mulch as needed until the plants grow in. Periodically remove leaves that have landed in your river bed and reposition rocks moved by runoff to keep your dry creek bed working for you when you need it. Also don’t start your dry creek bed too close to the foundation of your home if that area is flat. You can direct the water through a drain pipe connected to a downspout to a lower starting spot in your garden. So whether you are adding a dry river bed to add interest to your lawn-free landscape or to double as catchment for winter storm runoff, make yours look like it’s always been there. Tired of looking at that brown patch of lawn and trying to convince yourself it’s a badge of honor in these times of drought? You tell yourself “It greens up in the winter so I’ll water just enough to keep it from totally dying now”. But wouldn’t a beautiful, sustainable, low water use garden be a more inviting place to spend your free time? Replacing a lawn that is not used anymore can be the first step in a whole new kind of landscaping-a landscape that looks like it belongs where you live. Here are some very good reasons to lose the lawn and benefit the planet at the same time. Even in years where we have normal winter rainfall we always have a seasonal drought. It’s called summer. Without our usual winter and spring rains, though, even native trees and shrubs are struggling. All the more reason that plant selection now is even more critical than before. You’ve see pictures of some not-so-great looking lawn replacement projects. A drought tolerant plant here, another there, add an accent rock and that’s supposed to thrill you when you come home for the day? What’s missing is a garden designed to enhance our natural environment. When you remove your lawn, it’s a wonderful opportunity to not only create a garden than conserves water but also provides habitat for wildlife including birds and butterflies and improves the soil. A living landscape does as much for our own pleasure as it does for the environment. It increases biodiversity of plant, animal and insect populations. It fosters healthy soil which can hold more moisture by supporting microbes and insects. Healthy soil can filter pollutants and improve water quality. Think of using native and well-adapted, non-natives that connect with the natural landscape. Use tough plants on the edges and group greener, low water use plants closer to the house. 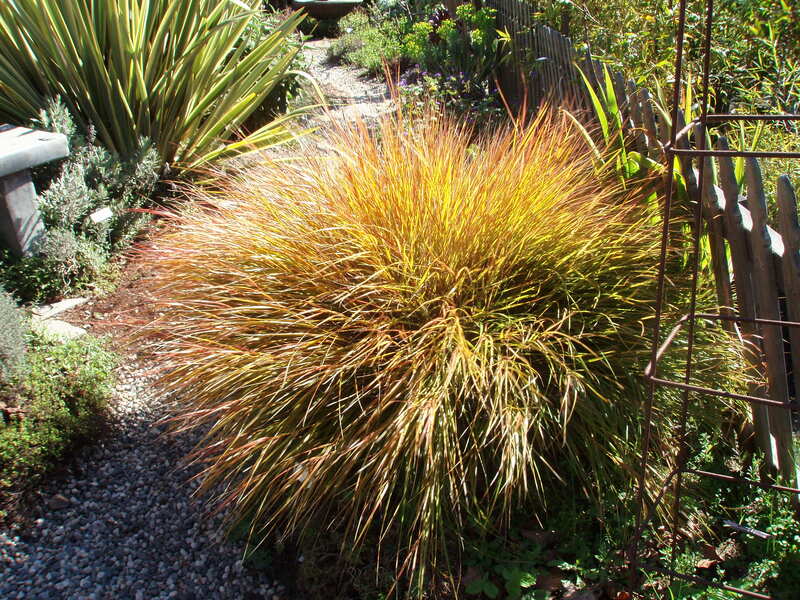 Here are some good plants to use in a lawn-less landscape that won’t break your water budget. When planting time rolls around this fall consider a green carpet of blue grama grass. This native sedge can provide a green carpet on much less water and can be mowed or not. 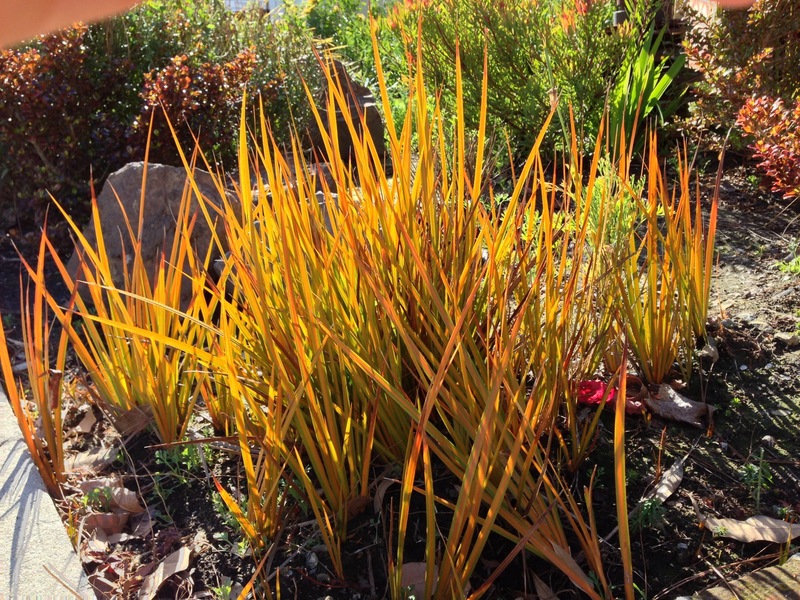 It’s on the list of approved water-wise grasses eligible for rebates from our local water districts. Another ground cover eligible for lawn replacement rebate is dymondia. I love the grey foliage of this low ground cover. It fills in nicely between stepping stones or can take light foot traffic in larger areas. For a taller look that you don’t need to be able to walk on, the ground cover forms of ceanothus, manzanita or creeping rosemary are good very low water alternatives to a lawn. I have a very low Hearts Desire ceanothus that hasn’t been watered yet this year and it still looks green and lush. Native yarrow, penstemon and salvia are the work horses of the garden needing little water once established and attracting all sorts of insects and birds. 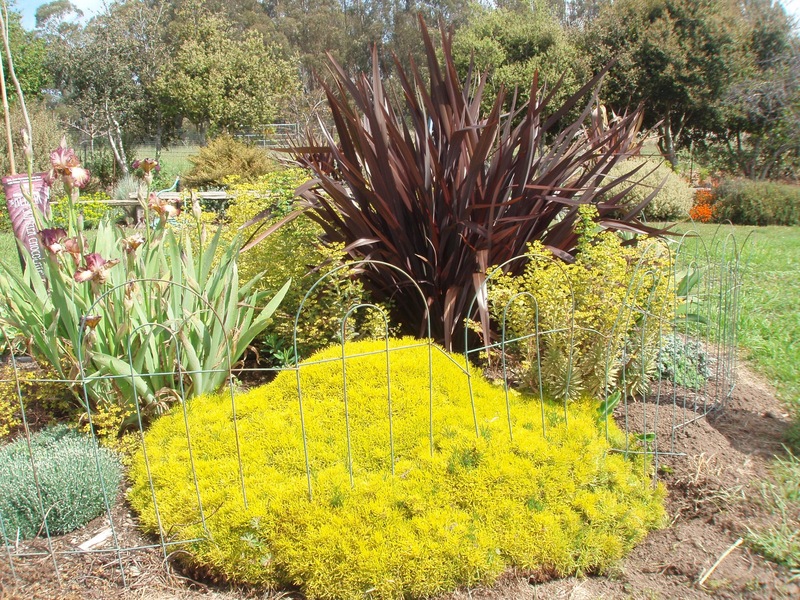 Other natives on the 800+ Approved Low Water Use Plant list include Pacific Coast iris, helianthemum, libertia, santolina, California fuchsia, rockrose, lavender, myoporum, coffeeberry, teucrium, verbena and kangaroo paw to name just a few. You can download the list from www.sv.org or www.slvwd.com. I am not a big fan of artificial lawns. They do not provide habitat for wildlife, beautify our environment or improve the soil. They get significantly hotter than the surrounding air temperature contributing to the heat island effect by increasing air temperatures. Also artificial turf is a synthetic material with a relatively short lifespan ranging from 10-20 years and will eventually end up in a landfill. They can not be recycled. 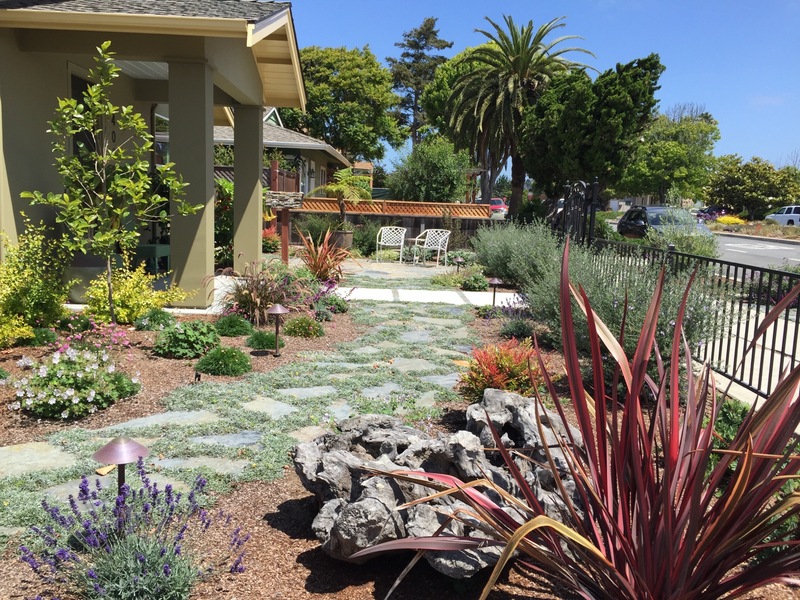 There are many other beautiful, low water use options that result in more sustainable and beneficial landscapes. Water and soil management as well as plant selection are key to water conservation in the landscape.